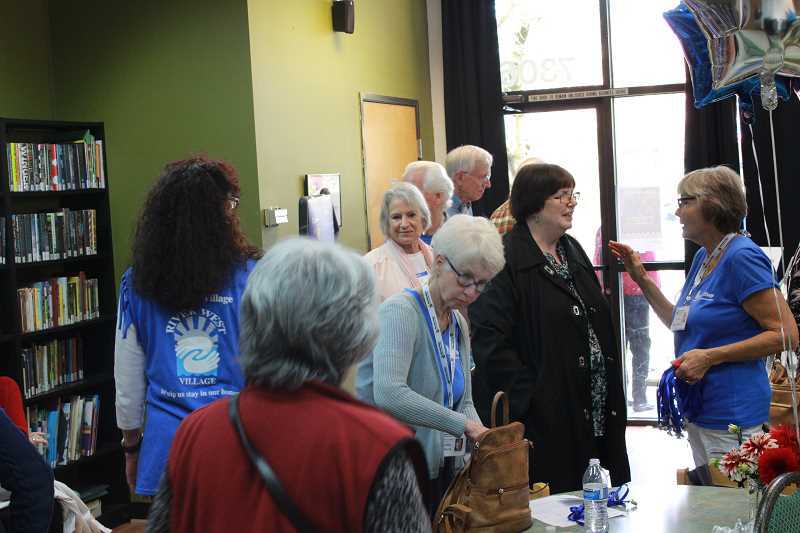 River West Village members, volunteers and prospective affiliates gathered in the Garden Home Library Annex on Oct. 1 for an informational afternoon of icebreakers, presentations, sign-ups, food and conversation with friends and newfound partners. The day marked the culmination of years of preparation and the inauguration of a program designed to allow elder citizens to stay in their homes and away from assisted living for as long as possible, foster community synergy and collective interest, and provide affordable services. It's also a response to the increasing average age of the population in the United States — a trend that is projected to increase in the coming decades. According to the Population Reference Bureau, the number of Americans age 65 and older is expected to increase from 46 million to more than 98 million by 2060 and increase from 15 to 24 percent of the overall population. "The Village movement is a new way to look at what some people call the third stage of life. What we know is that people are living longer and many of them are healthier," River West Village member and organizer Lyn Trainer said. 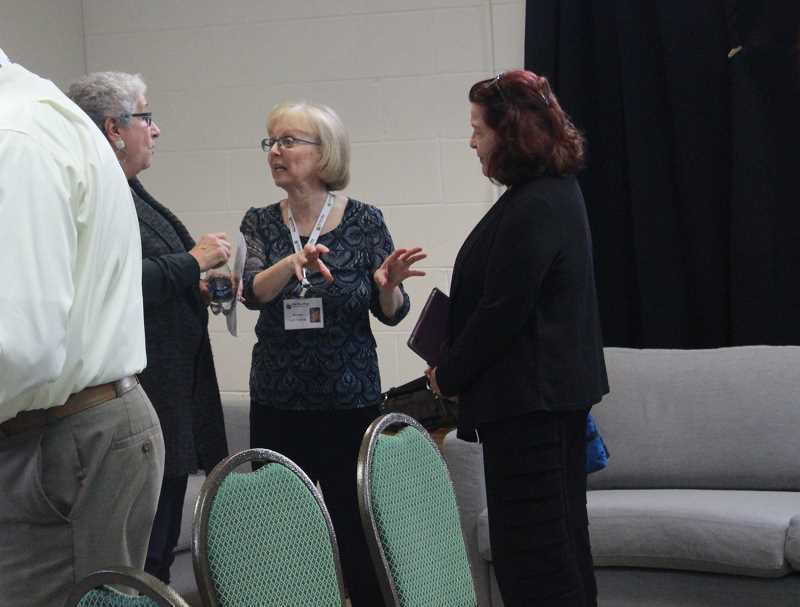 "We also know that there's a huge increase in the size of the population, and most of the people can't afford to live longterm in some sort of retirement community or assisted care. The idea of the villages is that 90 percent of people want to live in their own home as they age. And most of them can if they have a little help." The Village movement is a nationwide initiative that started in Boston in 1999 and is growing rapidly. The first Portland-based village opened in 2015; River West is the fifth village to sprout up in the area and a village in North Portland opened the day after River West's kickoff event. River West Village encompasses Hillsdale, Arnold Creek, Markham, South Burlingame and other Southwest Portland neighborhoods. It's a part of the nonprofit Villages NW Hub & Spoke Network. Some of the services volunteers provide include raking leaves, driving, technological assistance, handiwork, heavy lifting and other household tasks. They don't offer more extensive services such as medical care or house cleaning. Volunteer service commitment is flexible. River West also includes social groups such as coffee meetups, happy hours and book clubs. The village has been conducting these events for more than two years, but didn't begin the service aspect of the program until October. "I've lived in this area for 25 years, and when I worked full-time I was out and about doing things. If I went down to Multnomah Village, I never saw anybody I knew. Now through the village, I have a network of people and when I go out, I run into people I know," Trainer said. At its outset, River West had more than 50 volunteers and 65 members. (Some members are also volunteers.) Trainer says a population size of 300-400 would be optimal. Individual membership for full services, which includes the social gatherings, three roundtrip car rides per week and additional services, costs $65 per month. The program also offers other options for couples and for purely social memberships. River West volunteer Dale Pope became aware of the Village movement while watching a segment on NBC News hosted by Brian Williams a few years ago. The idea resonated with him, he says, and when his friend's health deteriorated after contracting Lou Gehrig's disease, the idea connected more viscerally. "It enhanced what I already wanted to do. It made it seem more immediate," Pope said. "I could see a lot of people that were my age that were physically not able to do some things. It brought it home more that there are a lot of people out there and I'm lucky I'm physically able to do things that other people can't do. I might as well help because I'm going to need it, too." Pope decided to join River West as a social member and a volunteer. Now retired, he spent his career in the construction industry and can help members analyze contracts, drive members around town and fix household defects. He also participates in the men's coffee program, is helping start up a poker group and may arrange a fishing trip at some point. Right now, the demographics of River West skew heavily toward elder citizens, but Pope believes a more balanced mix of young and old would be a huge benefit moving forward. "When I need help and my son's in town, I say, 'Hey, can you fix this problem that I have?' I didn't grow up with computers. Those are the kind of things where it would be good to have younger people's involvement. And it's good for young people and old people to mix," he said. Like Pope, Trainer is self-sufficient. But she has one nagging issue. She would prefer not to reach down to replace the cartridge in her water filter below her cupboard. She's hoping a volunteer will help her with this task when the time comes to replace the filter. "The likelihood of me crawling under the cupboard is remote. If somebody is willing to go and do that, that would be a huge help," Trainer said. Anne Gormely heard about the village from a friend in her yoga class and has been involved the last couple years with promoting the organization. She also informally provided chauffeur services to senior citizens before River West was officially underway. "The No. 1 thing is people are so appreciative because they don't like it that they've lost the ability to be more independent," Gormely said. "I'm learning that giving up your independence is a devastating thing to so many people. It doesn't happen all at once. Being steady on stairs, being confused around money. That makes me feel good that I'm helping them keep their life going." Gormely is currently a social member but says she could upgrade to full-service membership if something unexpected happens. "I'm a volunteer at this point and I have joined the social membership mostly because I want to support what the organization is building," she said. Jim Light and Carol Wise had previously worked on starting a village in Fremont, Calif. When they moved to Portland with Wise's mother Marguerite, Carol researched to find similar organizations. That's when she found River West. Marguerite currently lives in an additional dwelling unit in the couple's backyard, and a caregiver drops by frequently to assist her. However, Light and Wise would like to enlist River West volunteers to stop by occasionally to chat with her. "Just to engage her with stimulating conversation and company," Wise said. Though they work full-time, Light and Wise are also planning to serve as volunteers. Light plans to help out with handiwork around the house, while Wise could see herself offering medical advice or chauffeuring members to appointments once she has time. "It's really exciting. Portland has some really great elder care services already, and the addition of a local village is tremendous," Wise said. Added Light, "Sooner or later I'm going to be needing services myself, so why not volunteer until that time." For more information about River West Village, go to riverwestvillage.org or call 971-266-3187.